Like most people in our society, you might see the years from the age 30 onward as a slow, painful decline marked by the following outcomes: weight gain, fatigue, mysterious aches and pains, illnesses, memory issues, low libido, and sadness and anxiety. Contrary to popular belief, the real obstacle for most of us isn't age--it's loss of function. Our bodies are perfectly capable of remaining slim and vigorous, and our brains can absolutely stay clear and sharp--if we give them what they need. The problem is that most of us don't do that. We don't realize what our bodies need, so we eat the wrong foods, skimp on sleep, and deprive our bodies of the movement they crave. Overwhelmed by the stresses and the pressures of our lives, we take a host of prescriptions, never realizing how they might be disrupting our body's innate ability to heal. Most insidious of all, many of us lack the personal support and the community that we need to feel fully alive. Instead, we buy into the myth that age means decline. A pioneer and internationally recognized expert in integrative and functional medicine, Dr. Frank Lipman proves that you don't have to feel this way. You have a choice! 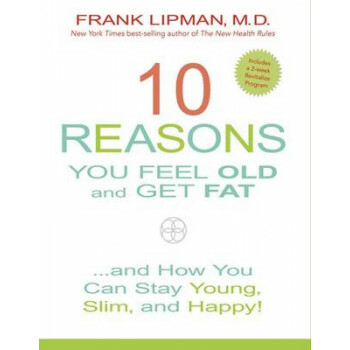 In his latest book, Dr. Lipman breaks through the common myths and misconceptions surrounding aging and dieting, and he zeroes in on what you need to do in order to feel your very best. His two-week Revitalize Program brings together key information regarding insulin resistance and carbohydrate intolerance, gut and hormonal imbalances, sleep disorders, medications and supplements, and community support. The Revitalize Program features delicious recipes, handy shopping lists and meal plans, simple exercises, and powerful stress busters to support you along the way. Dr. Lipman also offers a lifelong Maintenance Program, so that after two life-changing weeks, you can continue on your path toward ultimate health and wellness! In just two weeks--only 14 days--you can feel so much better than you ever imagined!